Believe it or not, Samaritans, a Suicide Prevention Center in New York City has been there for 67 years. Beginning in 1952, Samaritans created the first suicide prevention hotline in the world. And today, it has developed into a network of 400 affiliated centers in 42 countries. Over these years, Samaritans has answered over 1.3 million calls and provided 24/7 emotional support to people dealing with loss, trauma, illness, or simply need someone to talk to. Besides the efforts of 40,000 health providers, Samaritans wouldn’t have saved so much lives from desperation without the supportive community, which was given a massive thank you during the Spring Soiree Anniversary. 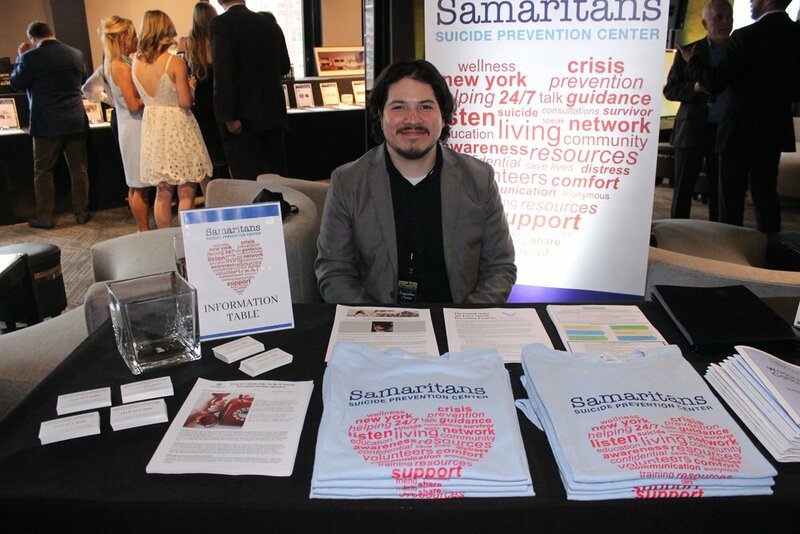 2019 is a special year for Samaritans, with the group celebrating its 10th annual Soiree. On Tuesday, April 9, the party was held at the breathtaking 230 Fifth Empire Penthouse, a ballroom facing the majestic Empire State Building and the city’s beautiful night scene. The Soiree was kicked off with a fabulous silent auction featuring the Miami Getaway journey. Winners will escape the New York cold a spend a carefree weekend at the stunning Mondrian South Beach, enjoying the local food and beverages that took them further to Mexico. I was fascinated by this idea, as it substantiated the concept of how we can relive our stress by calling the Samaritan Hotline, where warmth, love, and understandings reside. At 7:30pm, Samaritans’s Board President Wes Puryear and Executive Director Alan Ross took the stage and delivered a Thank You Speech to the crowd. Some of them were attending for the first time, and some have been the truth-hearted followers for the past 10 years. Audience with a great variety of identities in terms of age, race, gender, culture, occupation, and more came to celebrate the night together because the prevention of suicide, as a public health issue tied to mental health, proved the universality of people around the world. Everybody, under certain circumstances, can feel distressed and suiciable. Everyone, at certain moments in their life, needs a helping hand. When you are in the dark, it is better to stand with people and hold their hands than stay alone. As Alan Ross said during his speech, the Soiree was a concept of Samaritan’s core value. Guests were regaled with comfort food and beverages of two open bars. There were live performances by the incredible magician John Born, who could restore the Rubik’s Cube and read your minds in less than one second. Lively music by the genre bending, Darius Christian and DJ David “Prints” Aguilar ran through the night. The venue was lightened by twilit light bulbs in the room and city lights through the windows. As I was relishing the beef burger and sipping from the champaign, I realized that this is how life is. We can be fragile in the darkness, but we can always talk to people and treat ourselves with drinks, snack, music, and magic. Oh and maybe a getaway to Miami.